Tess earned her AKC Open Agility title this afternoon with a first place qualifying score at the Golden Triangle Obedience Training Club trial. Tess and Jim also had a second place qualifying run for their first Excellent A Jumpers with Weaves leg. Tess and Jim had another great weekend at CPE agility. They qualified in ten out of eleven runs, with five first place, four second place, and a fourth place. Tess also had a first place non-qualifying score on a wicked Jackpot course that was her only non-qualifying run of the weekend. Tess is now in Level 4 and 5 in CPE, so we're very pleased that she's able to do so well in the higher levels of competition. 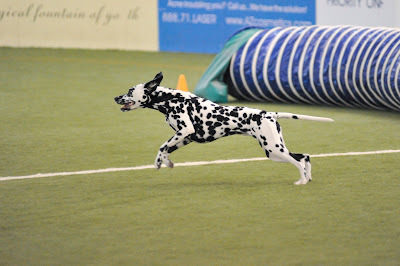 In the meantime, Jazz is getting closer and closer to her agility debut in early June at the NADAC trial in Zanesville, OH. 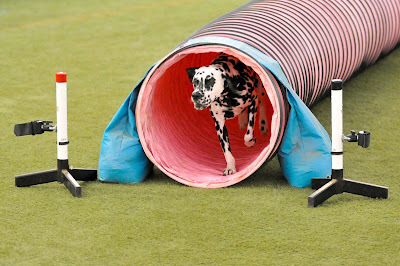 We hope that Jazz will follow in big sister Tess' pawprints and be successful in agility, but most of all, we hope that Jazz enjoys the sport as much as Tess does. Well, we're home from vacation and back to reality. Our week in Avon, NC, was probably the most enjoyable and relaxing vacation we've ever taken. It was so great to be able to share it with the dogs. I just wanted to post a few last pictures of Tess and Jazz from vacation. They had a wonderful time. Jazz went from being afraid of the waves on Sunday to jumping right into an incoming wave during the week. She had a ton of fun stalking the beach birds. It was fun to watch her strategy form, even though she never even came close to catching up with those winged critters! Tess basked in the sheer joy of walking (and digging) on the beach. She'd trot into the ocean to refresh herself and then back to the sand. She also loved all the scents in the sea air. We all enjoyed spending time with each other, as well as with our friends and their dogs. We're already making plans for next year, so stay tuned! One of the things Tess and Jazz have loved best about the beach is their ability to dig away in the sand. This is strictly forbidden at home, so it is quite a treat for the girls to just dig randomly, resulting in some very sandy faces! Here's the whole gang who we traveled with to the Outer Banks. From the left, it's Shaina, Toby, Rocky, Sammie, Jazz, and Tess. Jazz, Tess, Toby, and Shaina at Ocracoke Island. Tess and Jazz on the beach at Ocracoke. I just had to post this video of Tess and Jazz's first experience at the beach. This was yesterday morning around 7:00 a.m. Can you tell how excited Tess was to be there? She was just ecstatic! Jazz was a bit unsure about the ocean at first and would back up as the waves came in, but by later that afternoon, she was trotting into the surf and having a grand time. We have an awesome house at the beach and we're having a wonderful time. More photos later! Well, the car is packed and the girls are ready to head out on our beach vacation in the Outer Banks. We're all looking forward to some fun in the sun!